When this card is Normal Summoned: You can send 1 Zombie monster from your Deck to the GY. If this face-up card in its owner’s control leaves the field because of an opponent’s card effect: You can Special Summon 1 Level 4 or lower Zombie monster from your Deck, except “Samurai Skull”. Welcome to a miscellaneous week of sorts. I picked the cards, and you get a little variety this week. Samurai Skull is an interesting enough option for a Zombie player. Dark and Level 4, with 1700 attack is quite reasonable (although the 0 defense is troublesome.) When Normal Summoned, you’re allowed to send a Zombie from your Deck to your Graveyard. That’s obviously a good thing, even if you have to use your Normal Summon to do it. It’s good this isn’t Flip dependent as the 0 defense won’t survive anything. If this card leaves the Field via opponent’s card effect (not Battle take note) you can a Level 4 or lower Zombie from your Deck. Present company excluded, naturally. There are better Zombie cards, but certainly worse ones too. If it works for you, use it. Samurai Skull is a great new addition to Zombie-archetype support. Good stats for a Level 4, DARK, Zombie support, and a built-in Foolish Burial on Normal Summon, what more could you ask for? Special Summon ability upon destruction? Yes. SS gets Mirror Force or Dark Hole, you get a Level 4 or lower Zombie except Samurai Skull. Bury the Mezuki in your deck upon Normal Summon, then when Samurai Skull dies from a card effect, drop Zombie Master on the field. Samurai Skull could be run in 3’s in a Zombie deck because it does everything that Zombies need to be done. At the very least you’ll get another Foolish Burial to thin your deck and set up your grave. While not getting anything off a Special Summon of itself is a negative, SS is a good card to at least have one of in any Zombie-based deck. Some themes will always get support. In this case, Samurai Skull gives support to Zombies. It’s a Level 4 Dark Zombie-type monster with 1700 Atk and 0 Def. When it’s Normal Summoned you have the option of sending 1 Zombie from the deck to the grave, thus setting up future plays with Shiranui. Then if it leaves the field because of an opponent’s card effect, you can Special Summon any Level 4 or lower Zombie from the deck except itself. So both effects are free and don’t deplete any resources, and there are no once per turn clauses. 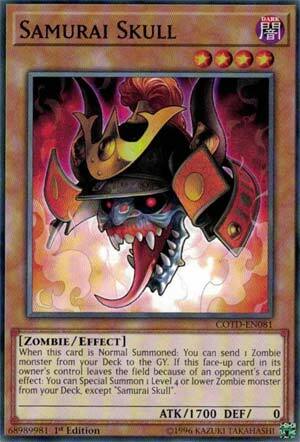 Certainly, Samurai Skull is one of the best commons in Code of the Duelist even if you only need to run 1 or 2 as a backup option when using Zombie engines. Even the stats are good. Score: 4/5 Old and new Zombies will love this. We took two weeks off from Code of the Duelist for special themed weeks, but we are back to reviewing the cards from this set. As we all know, Vendreads were one of the two TCG Exclusive Archetypes that debuted in Code of the Duelist, and they were nice enough to give us a TCG Exclusive to help Zombies in general, Samurai Skull, but it is just odd that they felt the need to print this. Samurai Skull allows you to send a Zombie from the deck to the GY on Normal Summon, so summoning him off Mezuki (one of the best Zombie cards ever) will not get you the Foolish Burial like effect. This is weird because we already had Gozuki, and Gozuki sends a Zombie from the deck to the GY each turn making it far better. I don’t see why they felt the need to have this effect when most of us would prefer to run Gozuki. At least Samurai Skull has a unique effect, if it leaves the field because of an opponent card effect, you can summon a Level 4 or lower Zombie from the deck, except Samurai Skull. This is neat and all, but again kinda not needed, cause Gozuki can also summon Zombies (but from the hand) when it is sent to the GY. Yeah, summoning from the deck is better than from the hand, but I really think this card wasn’t necessary for Zombies. The card overall isn’t bad for Zombies, far from it. However, the existence of Gozuki hurts the score of this card a tad bit, because Gozkui is that much superior to this card. This card is yet another card that helps to support Zombies by sending Zombies to the Graveyard for later consumption… Think Mezuki, Plaguespreader Zombie, Shiranui Spectralsword, Wightprince (or other Skull Servants) or basically any Zombie that you’ll like to have revived by Mezuki or any Zombie card that can help you Summon or fuel cards like Dark Armed Dragon, Black Luster Soldier – Envoy of the Beginning or Dragon’s Mirror. Yet how this differs from cards like Uni-Zombie or Gozuki can be considered to be quite important. Samurai Skull’s effect activates upon its Normal Summon, meaning that in order to prevent its effect you have to have some sort of Negation lined up or a Counter Trap like Solemn Warning… Since that prevents Samurai Skull from ever hitting the field to begin with. Actually Solemn Warning is 100% effective against Samurai Skull since this also prevents its second, when it leaves the field effect from activating. The biggest issue with Samurai Skull though is that it requires a Normal Summon in order to send a Zombie to the Graveyard unlike both of Uni-Zombie and Gozuki which can use their effect to send any time that they are on the field. That said, because Zombies very early on do have a strong reliance on their Normal Summon Samurai Skull provides a much safer way to be able to proceed with this easily disrupted time. And it should also be noted that because of the Normal Summon requirement of Samurai Skull’s Zombie sending effect that there is no “Once per turn” clause to this part of its effect (nor any of its effects), so if you are able to Summon an additional copy via Double Summon, Chain Summoning or Gem-Knight Seraphinte then you’ll be able to do so again. Additionally, if Samurai Skull has left the field because of an opponent’s card effect (except for something that would shuffle it back into the Deck (think Reborn Tengu)) you are able to replace it with another Zombie of Level 4 or lower, which provides you with an opportunity to take advantage of the fact that in order to avoid the second effect, most of the time an opponent will be needing to destroy this by battle. Rating: 3.75. The Normal Summon part really is a bit of a hindrance to the versatility of this but that it is harder to disrupt and is at times able to also replace itself if removed from the field makes this quite a valuable addition to Zombies… And being Dark is also a useful.